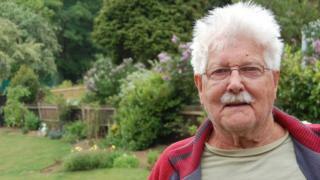 A 94-year-old peace campaigner with no criminal record has won an eight-year battle to have his details removed from a police "extremism" database. John Catt, from Brighton, who took part in a number of campaigns, argued the retention of his details was unlawful. The Court of Appeal ruled in his favour in March 2013 but this was successfully challenged by police chiefs at the Supreme Court. Now the European Court of Human Rights has overturned that decision. Mr Catt first took legal action after the Association of Chief Police Officers (Acpo) refused his request for all the information held on him to be deleted permanently. The database is maintained by the National Public Order Intelligence Unit, originally under the supervision of Acpo, but now under the Metropolitan Police Commissioner. Mr Catt's lawyer Shamik Dutta said his client had spent eight years battling with the police, the Home Office and the government to have his data deleted. In today's judgement the European Court of Human Rights ruled unanimously that there had been a violation of Article 8 (the right to respect for private and family life) of the European Convention on Human Rights. The case concerned John Catt's complaint about the collection and retention of his personal data in a police database for "domestic extremists". The court found in particular the data held on the applicant concerned his political views and that such information required particular protection. The court also had regard to Mr Catt's age - he is now 94 - and the fact he had no history or prospect of committing acts of violence. While collecting the information on him had been justified, retaining it had not, particularly owing to a lack of safeguards, such as time limits. There had therefore been a violation of the convention. Mr Catt previously described his fight as being "for the sake of other innocent people whose lawful political activities are being monitored by the state".